Beast Coast Trail Running by Scott Snell: Are Treadmills Torture? Not With Zwift! Are Treadmills Torture? Not With Zwift! 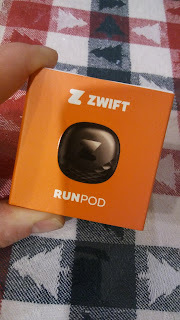 Disclaimer: I received a Zwift runpod to review as part of being a BibRave Pro. Learn more about becoming a BibRave Pro (ambassador), and check out BibRave.com to review find and write race reviews! Most trail runners I know tend to have a pretty negative opinion of treadmill running, some I would dare to say even hate it. Maybe it’s because of what is missing from the running experience when on a lush trail in the sun compared to the typical gym environment in which you find treadmills to commonly occur: no fresh air, no wind in your hair, no sounds of birds calling or water flowing. Maybe it’s because of what the gym environment adds: “gymtimidation”, all of the current hottest music tracks (sorry, not a fan of most), scents of the locker room, muscle heads admiring themselves on the expansively mirrored walls. Maybe it has something to do with social anxiety and the feeling of freedom that is provided by running alone outdoors. Or just maybe it’s due to the fact that these dreadmill hating trail runners can’t overcome the fact that the origin of the treadmill can be traced back to devices used as a form of punishment and prison labor in the early Victorian period in Britain. British engineer Sir William Cubitt is credited for the introduction of treadmills as a form of prison labor in 1818. The penal treadmills were used to grind grain in 44 English prisons at their peak. Over time, the practice waned and was ultimately abolished in 1902 when Britain passed the Prisons Act (1898). Whatever the reason or reservations trail runners have for avoiding treadmill running, there is now a tool available that aims to improve the overall treadmill experience. The team at Zwift has created a product that virtually transports a treadmill run to almost anywhere in the world. Popular routes from the US include Richmond and New York. Popular oversea courses feature Innsbruck and London. The fantasy island of Watopia is even an option for zifters. And the benefits don’t stop at running virtual courses. Zwift offers structured training workouts to help you prepare for your next 5K, half marathon, or triathlon. Additionally, the Zwift platform also offers a community to train with. If you want to run with friends who are on the other side of the world, Zwift makes that possible with virtual group runs. Since I’m not a particularly huge fan of treadmill running I thought Zwift would be perfect for me to make any treadmill running I do more enjoyable. Unfortunately, the required app that syncs with the Zwift runpod was not compatible with my Android phone (LG Stylo 2 plus) so I was never able to personally experience the Zwift platform. As of now the app is only fully available on the Apple store. The Android app is currently still in beta form and from what I could gather is only compatible with newer Android devices. There is also the PC or Mac version of the software that can be used if your treadmill set up allows (I couldn’t manage to pull this off at my local Planet Fitness). Although I wasn’t able to partake in the excitement of going for a Zwift run, plenty of my fellow BibRave Pros have and had lots of positive things to say about it. Heck, they even made me feel a little jealous of a treadmill run?! Here’s a sampling of some of their reviews after experiencing some Zwift virtual runs.